Multiwavelength Optical Networks: Architectures, Design, And Control: 9780521881395 Hardcover - LIMEROCK BOOKS INC. Updated and expanded, this second edition of the acclaimed Multiwavelength Optical Networks provides a detailed description of the structure and operation of modern optical networks. It also sets out the analytical tools for network performance evaluation and optimization for current and next generation networks, as well as the latest advances in enabling technologies. Backbone optical networks are evolving to mesh topologies using intelligent network elements; a new optical control plane is taking shape based on GMPLS; and significant advances have occurred in Fiber to the Home/Premises (the "last mile"), metropolitan area networks, protection and restoration, and IP over WDM. New research on all-optical packet switched networks, is also covered in depth. Also included are current trends and new applications on the commercial scene. This book is an invaluable resource for graduate and senior undergraduate students in electrical engineering, computer science, and applied physics, and for practitioners in the telecommunications industry. 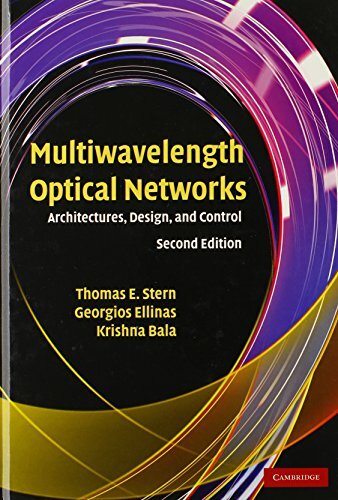 This is the second edition of the acclaimed Multiwavelength Optical Networks, describing architectures, technologies, and tools for performance evaluation and optimization of modern optical networks, using a unique blend of modern enabling technologies, network architectures, and analysis. It is an invaluable resource for graduate and senior undergraduate students in electrical engineering, computer science, and applied physics, and for practitioners in the telecommunications industry.